If you should get an email with this alerting you to some payment you don’t remember- take note…it is a scam. Do NOT click on any links. If you are worried, go to your accounts online and check to see if there are any charges to this amount. This is showing it was ‘paid via credit card and I only have one. I easily checked my account through my iPhone app and found no activity. Also take note of where the email is coming from. I noticed it looked legit until you saw the actual email was from an AOL account. A real business will have an official email with their web site domain included in it. You can also do a Google search with the email and add scam to see if anything shows up. I don’t even bother with that- I just delete or report the scam. To report spam/scam email. Take note of the email. If it is a gmail, yahoo, aol, or other type email, you can report to them about the specific account. For example giranpour@aol.com is from AOL so I google AOL scam email and got this page. Which includes an email I can forward the scam email to them. If you have questions or comments, please post. A desktop skin for Windows that adds interactivity or animations as well as addons for functionality. This provides a tool to corral icons into groups with a label to help organize the desktop. This programs changes the color of desktop icon to sort and organize them on the desktop. This adjusts the monitor color hue to help you sleep. How does it work? It switches the hue to a warmer yellows, adjusting to the time of day. This programs changes the ‘skins’ of desktop themes. Although Windows has various themes, WindowBlinds adds more choice and variety. Check your Internet Speed. Download Speedtest program or you can download their app here. 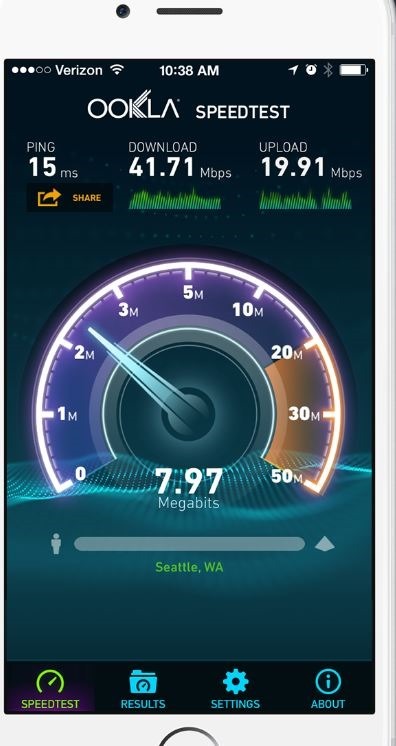 This free program can scan to see what your speed of your Internet Service Provider. Once scanned, results will show your download and upload speeds in megabyte. If the number is low, consider contacting your ISP provider and see what your service includes. Reboot your Internet Router and Wi-Fi. Depending on your setup, some folks have a router that includes the Wi-Fi feature built in it. If you have two boxes that are connected, you have one Internet Modem that bring the Internet to you via a cable cord, while the Wi-Fi router gives a wireless signal. To reboot, unplug the power cord or cords, unplug connections, and wait for one minutes. Now reconnect everything. It will take a few minutes to start your Internet again. You should see lights blink indicating a signal. If this doesn’t work, you will need to contact your service provider and ask if they can release/renew your IP address, or check your service to see if there are any issues. (Once I had a wasp nest outside where the wires connected to my house!). You can also renew/release your IP via the DOS command. This can be intimidating for the computer noob, but the instructions are clear. Some causes of slow Internet is not the Internet at all but something on your computer. This could be a browser extension, a browser toolbar, malware, virus, or the router is going bad. It is also possible that if your connection is not secure, someone is using your connection for themselves. Add security if you suspect this. Make sure your Wi-Fi is secured. Click this link for instruction on how to check. Change your Wi-Fi password. This will vary depending on the Wi-Fi router model you have. Use Google by searching the make/model of your Wi-Fi router + change password. This will give you instructions on how to access your Wi-Fi settings through a web browser. Another tip is if you own a smart phone, check to see if your Wi-Fi router has an app. I know Linksys and Netgear have apps that enable your phone to manage the router. If you have questions, post in comments or send your question to email@learnthepc.net. Did you know there are many free versions of software out there that can replace costly programs? Just bear in mind that some don’t offer the same features, or in some cases are not as intuitive to learn as others. They are free, however, so download and try them out. I even use both paid versions and free versions depending on the features I like. http://www.ninite.com– lots of downloads to choose from, many of which are ‘must-have’ software like antivirus and security, to video/photo editors, to other useful programs. 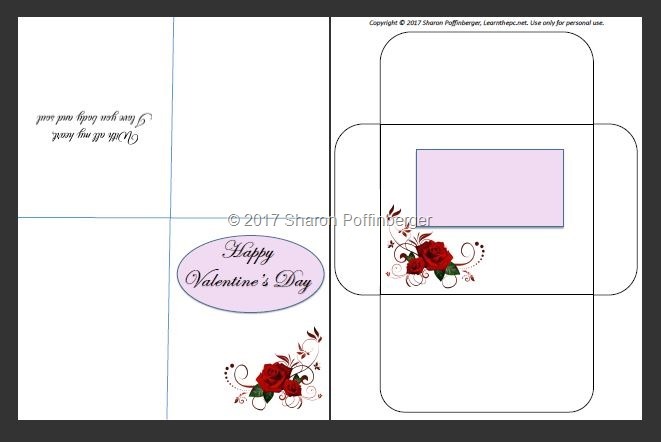 You can find a number of free printable Valentine’s Day cards on the Internet, but I made a design that includes a matching envelope. Take a walk in a park. Even in cold weather, you can enjoy the scenery and the presence of your loved one. Dinner- Make a special dinner or go out to a restaurant. You can also start a tradition of making a favorite meal for this holiday. Share a bottle of wine or sparkling cider. Make love coupons to be used in the coming weeks. Here is a printable love coupon file. Give/share a massage. You can also use the special scented oils, but baby oil works fine too. How to give a massage. For those who do not have anyone to celebrate, take the day to love yourself or enjoy time with single friends to celebrate love of yourself. Take a bubble bath. DIY Bath Homemade Bubble Bath. Buy yourself chocolate, wine, or other gift to appreciate who you a re. Buy yourself flowers or a single rose to remind you that you are a lovely person. Have a singles party with friends who are also single. Watch a movie by yourself or with other single friends.